Pedestrian Accident Are Real Too - Carabin Shaw Law Firm | San Antonio Law Firm specializing in Personal Injury and Wrongful Death - Experience you need. Results you want. If you have been injured in a pedestrian accident, you may be eligible for compensation in a personal injury claim. And while you may be able to settle a small claim on your own, any claim involving serious and substantial injuries should be handled by a pedestrian accident lawyer. A pedestrian accident lawyer knows the damages to which you may be entitled – this includes current and future medical expenses, your pain and suffering and any lost wages from work, as well as how to calculate them. In addition, your attorney can negotiate with the insurance company for a fair settlement. A pedestrian accident lawyer understands your state’s negligence laws – this will help in analyzing evidence to defend your best interests throughout the claims process,including any degree of fault on your part that the insurance company will try to claim to reduce or deny the compensation you deserve. A pedestrian accident lawyer knows the tricks and tactics commonly used by the insurance company – this may include getting you to say or sign something that can drastically reduce the value of your claim. A pedestrian accident lawyer can take your case to court – if this is necessary, your attorney can argue your case at trial. While minor injuries can often be easily settled without the help of a lawyer, long-term or permanent injuries can cost you hundreds of thousands of dollars in medical bills alone. Once you accept an offer from the insurance company, you are almost always barred from seeking additional compensation in the future, even if your accident injuries require future surgeries or care. 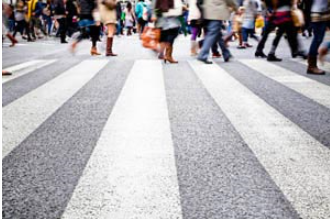 A pedestrian accident lawyer can make all the difference. You can learn more about the difference a pedestrian accident lawyer can make by visiting our article library. While you can’t predict whether a pedestrian accident in will happen to you or someone you love, you can be sure of your best course of action following an accident: seek medical attention and contact a pedestrian accident lawyer as soon as possible. Recovering from your injuries after a pedestrian accident should be your main priority, not dealing with insurance adjusters and complicated legal paperwork. Before accepting a settlement offer, contact the Law Offices our office to set up a no-cost consultation with a pedestrian accident lawyer about your case.